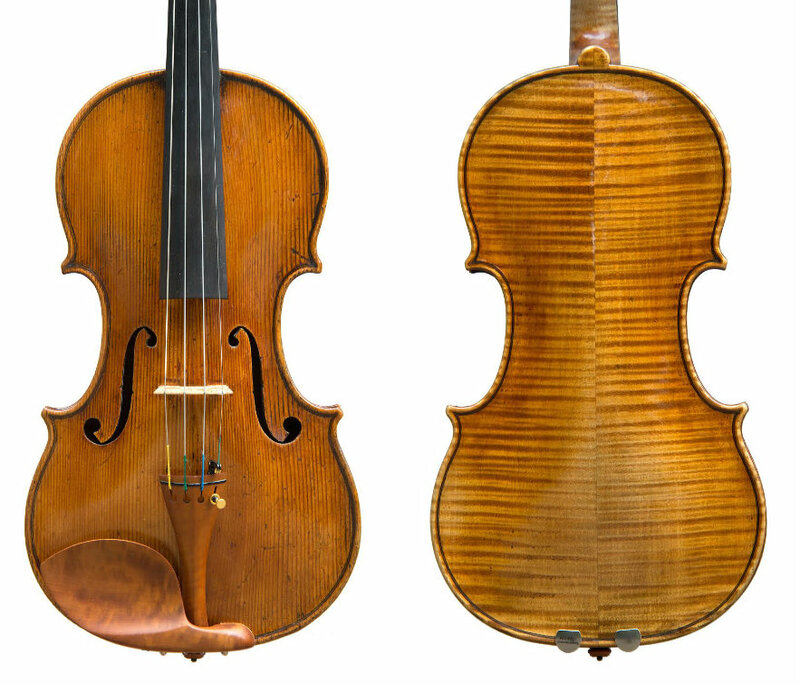 The importance of the three Antoniazzis – Gaetano, Riccardo and Romeo – in late 19th- and early 20th-century Italian violin making cannot be overstated. With the advent of their unique style, Milan became the capital of violin making in Italy, where excellent craftsmen learned their skill and passed it on to their pupils in numbers unprecedented since 17th-century Cremona. 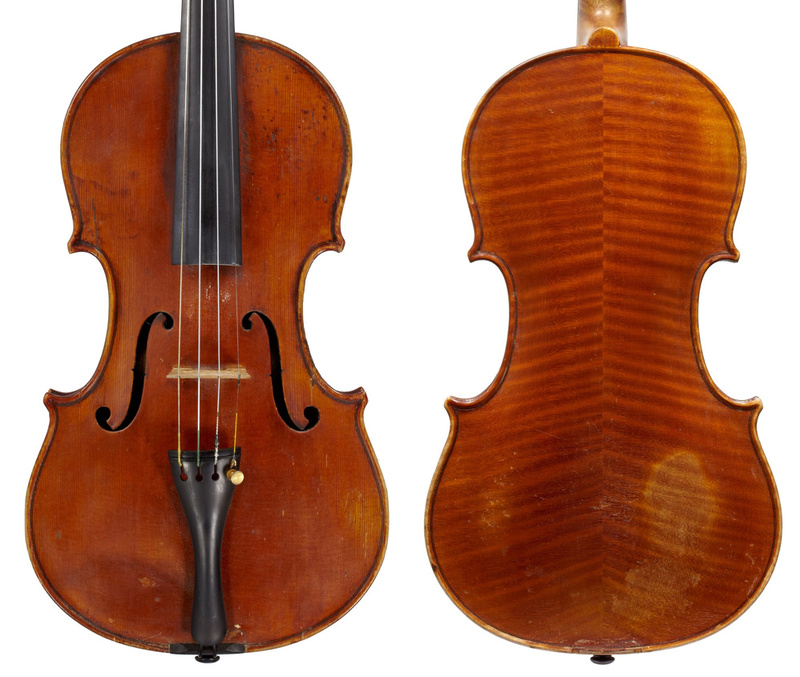 Riccardo, the elder violin making son of Gaetano, was born in Cremona in 1853, when his father may well have already been assisting Giuseppe and Enrico Ceruti. His childhood and early youth were marked by the family’s constant moves, no doubt precipitated by the financial hardships facing Gaetano, a fine violin maker who was nevertheless forced by circumstances to undertake other odd jobs in woodworking. Romeo, the last of Gaetano’s eight children, was born in 1862 in Cremona. In 1870, having spent time in Mantua and Genoa, the Antoniazzis finally settled in Milan and thus became unwittingly responsible for the transfer of the Cremonese tradition to that city. While Romeo was about eight years old, Riccardo, by then 17, would already have been helping the family make ends meet and would have been familiar with carpentry as well as violin making. In 1880 Riccardo traveled to Nice, where he initially worked for Nicolò Bianchi. The older maker died the following year, but Riccardo appears to have stayed on in Nice until 1886, probably doing repairs. By then he must have been a skilful violin maker and restorer, though little evidence of his violin making before the late 1880s and 90s survives. Generally, the work of all three Antoniazzis from the 1880s is little known, probably because most of their instruments were later passed off as the work of more illustrious makers, in particular the Cerutis. There are, however, a few examples by Riccardo from the early 1880s bearing a Milan label, which suggest that during those years he was not permanently stationed in Nice. During his brother’s absences from Milan, the talented Romeo wasted no time in developing his own skills and produced some fine interpretations of the G.B. Ceruti style. 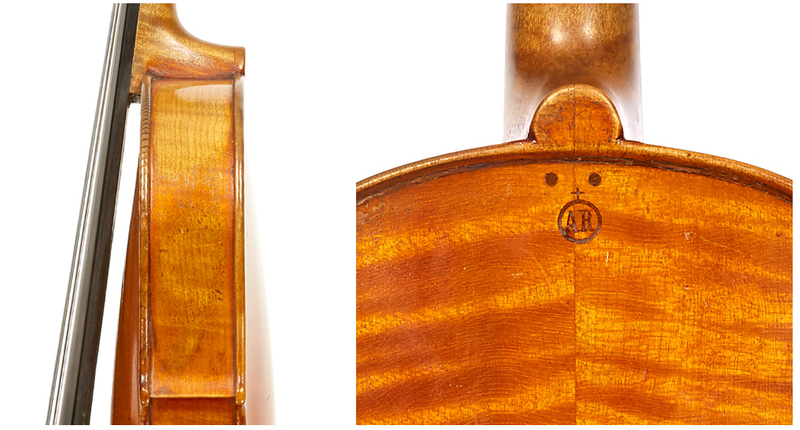 These early Antoniazzi family instruments, rarely correctly identified, remain among their most interesting stylistically and demonstrate that their work did indeed have late-Cremonese roots. Riccardo returned to Milan in 1886, which coincided with the arrival there of the young Leandro Bisiach, who was destined to have a decisive effect on the development of the city’s violin industry and to play a major role in the work of the Antoniazzis for the next 15 years (see our previous feature on Bisiach). Bisiach soon became a pupil of the Antoniazzis, using this training and his considerable business skills to propel himself to a level of fame and fortune unknown in the violin making profession since Stradivari and Vuillaume; conversely, the Antoniazzis, altogether lacking in business sense, proved unable to break free of the artisan mentality. They were never officially and permanently registered as fully fledged, independent violin makers; instead they alternated between violin making and other manual labor, often working for other firms – mainly those of Bisiach and Monzino. These early Antoniazzi family instruments, rarely correctly identified, remain among their most interesting stylistically and demonstrate that their work did indeed have late-Cremonese roots. By 1889 Bisiach had opened a large workshop alongside a successful business dealing in old instruments. It seems that in the early 1890s all three Antoniazzis were already working for him, creating some of the finest Milanese instruments ever made, and it was this very collaboration that supported Bisiach’s establishment. Though eclectic stylistically, these are perhaps the most ‘classical Cremonese’ of the Milanese instruments since the early works of Giovanni Grancino. The early Antoniazzi instruments made for Bisiach are rather Amatese in their modeling, but with Stradivari-like archings. Some are loosely modeled after Guarneri ‘del Gesù’, though the overall model is entirely personal apart from the Guarneri-like soundholes. ‭From the mid-1890s, and especially after the death of Gaetano in 1897, the style of Bisiach instruments gradually changed as Riccardo and Romeo’s skill asserted itself within his workshop (see 1900 example by the brothers). The high quality of this product is nearly on a par with the earlier ones. Complemented by the best available materials, nothing is oversized, heavy or awkward (characteristics sometimes associated with Riccardo and Romeo’s later productions); instead they evoke memories of the great, classical Cremonese makers, as well as the finest works of G.B. Ceruti. The Antoniazzis thus projected their Cremonese heritage, for the most part, ignoring all the pre-existing Milanese influences. After about 18 years of association with Bisiach, the Antoniazzis seem to have finally fallen out with him, as by about 1904 the brothers began working for the firm of Monzino & Sons – seemingly a downgrade, as this was a general music shop, a far cry from the prestigious violin establishment of Bisiach in the Piazza del Duomo. Though the Antoniazzis never managed to unite their efforts in their own partnership, the brothers were at this time also prolifically constructing fine instruments independently. 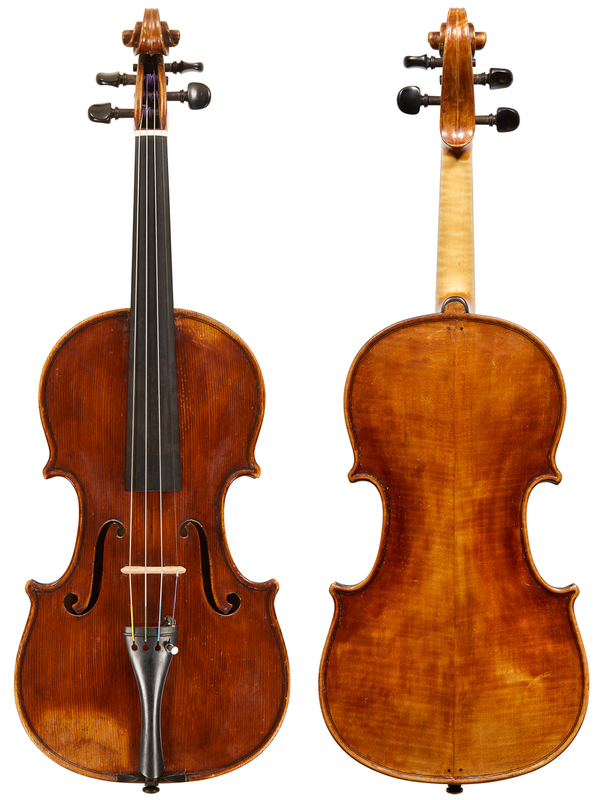 Moving away from the rigidly classical Bisiach style, they both adopted a more eccentric approach, experimenting with models and varnish colors and textures, though they consistently used attractively figured wood – something that seems to have become essential in 20th-century violin making. Antoniazzi labels always mention their Cremonese heritage: Riccardo’s state that he is from Cremona and the son of Gaetano, while Romeo’s later labels state that his instruments were actually made in Cremona, with a brand of the Cremona coat of arms – a ploy devised to make up for the absence of a regular business address and to reassure prospective clients that his instruments could be linked to the legendary town of his birth. These instruments are covered with thicker, more durable and more transparent varnishes tending towards brighter orange or redder hues. Antoniazzi varnishes are never antiqued, unlike those of Bisiach’s during and after their collaboration. Bisiach and his new pupils, including Gaetano Sgarabotto and later Giuseppe Ornati, Celeste Farotti and Giuseppe Tarasconi, were now in direct competition with the Antoniazzis in a developing Milanese market for new instruments. This may have prompted the brothers to increase their production, resulting in a drop in quality during the last period of Riccardo’s activity. Loosely speaking, this period began in 1904 with their employment at Monzino & Sons. For experts it is perhaps the most treacherous period in Antoniazzis’ making, as the work of their many pupils becomes very close in style and quality to their own instruments. Some of the pupils’ examples acquired Antoniazzi labels at the time of their production, with or without their consent; others more likely did so after their death. In any case, the brothers’ work took on a more commercial aspect as they became supervisors whose job was to train a number of makers to produce high-quality instruments as rapidly as possible. A finished instrument coming into the world as by Antoniazzi made in the Monzino workshop could actually have been made in part by any one of several makers who worked there. Riccardo’s favorite assistant was Erminio Farina, who appears to have made many of the scrolls for the Monzino–Antoniazzi instruments. During this period, however, Farina also made instruments of his own, some of which later acquired attributions to Riccardo. The characteristics of the later instruments by Riccardo and Romeo vary somewhat. Generally, Riccardo’s work is superior to that of his younger brother; Romeo’s instruments are more plentiful and his output increased further, at the expense of quality, after Riccardo’s death. Many of them are long, at times exceeding 360 mm in body length. There are, however, some that are fairly faithful to the earlier Antoniazzi model, with nicely channeled edges, delicately shaped, compact corners and curvaceous, carefully fluted soundholes, at times placed a little higher than normal. These characteristics help to distinguish Antoniazzi instruments, or those mostly made under their supervision, from the work of their followers. Normally Antoniazzi varnish is transparent, evenly applied and somewhat hard in texture – at times too hard, with a tendency to chip. The best type is softer, but never so soft as to wear easily. In this respect the Antoniazzis were taking the long view; they wanted the instruments to stand up to many years of use before achieving a beautiful patina. By contrast, the softer varnish of some of their contemporaries tended to acquire this patina relatively quickly, but then shed it within 50–100 years. Even today, the best of the Antoniazzi varnish is only just showing signs of an attractive type of wear similar to that of early 19th-century Cremonese instruments, in particular those by Storioni (as shown below). Most, possibly all, of Riccardo’s instruments are pinned at the back with large ebony pins – much like those of the Cerutis. This feature again serves to distinguish him from many of his pupils, including Romeo, who did not generally pin his instruments. A small brand of a circle with a cross at the top and his initials ‘AR’ inside it (similar to the brand used by Ceruti on his labels), placed at the top of the backs, is another trademark feature, but it does not always appear and one must be careful not to confuse this with the larger ‘AR’ brand associated with later copies of Romeo’s violins, made after his death mostly by his pupil, Piero Parravicini, who also made some instruments for Romeo. Other features that distinguish Romeo’s work from that of his brother are the broader, longer corners and generally a rounder, more masculine model than that of Riccardo. The soundholes, though sometimes curved like Riccardo’s, are either somewhat more slanted, or are elongated and upright. The volutes of the heavy scrolls are fairly deeply cut and are often more oval than Riccardo’s. While Riccardo made a few cellos and the occasional viola, Romeo seems to have produced more of both instruments of various grades and sizes. Riccardo Antoniazzi died shortly before his 59th birthday in 1912. His great abilities did not bring him financial reward and he perished as a humble employee of a general music store despite his accomplishments in founding and perpetuating the modern Milanese tradition of violin making. Romeo, who can be credited with similar accomplishments, carried on for a further nearly 13 years until his death in 1925, which explains his far greater, though increasingly commercial and haphazard, output. 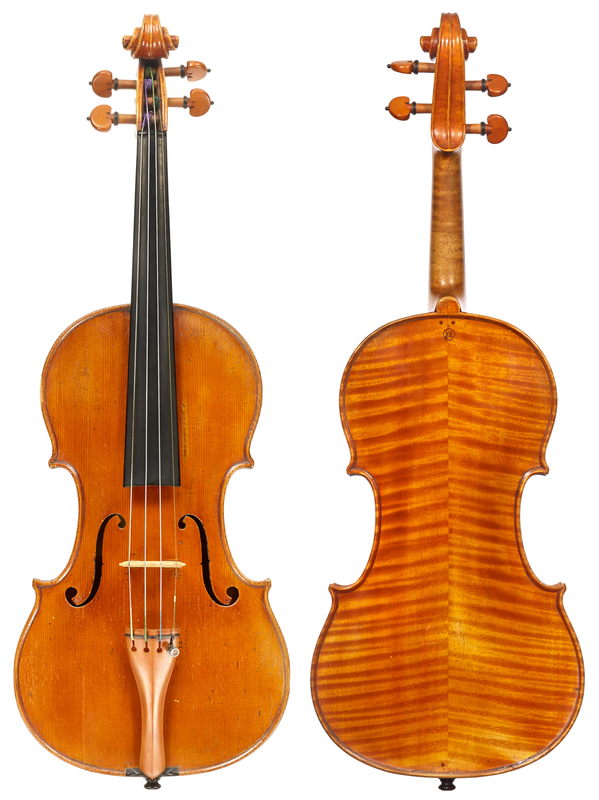 In order to compete favorably, instruments had to be cheaper than Bisiach’s growing production and similarly priced to a large contingent of excellent emerging Milanese makers of the Antoniazzi and Bisiach school. Also see our feature about one of Riccardo Antoniazzi’s pupils, the Californian maker Alfred Lanini.